Katy Perry might be single and ready to mingle, but ex-hubby Russell Brand is ready for another long-term relationship. Find out about his rumored new girlfriend. Comedian Russell Brand has moved on quite nicely from his ex-wife, Katy Perry — he’s dating a 22-year-old model! Even better? Nikolett Barabas must not have taken the celebrity girlfriend public relations class yet, because she’s more than willing to dish on him. The problem? Barabas might be more into it than he is. Interesting. Is she just a rebound, then? They’ve been spotted together in several different cities, including New Orleans. Still, Brand is a self-admitted womanizer who might not be ready to settle down again. “I haven’t always treated women well — more than one relationship has collapsed because of my infidelity — but to this day I feel a fierce warmth for women who have the same disregard for the social conventions of sexual protocol as I do,” Brand said of his past relationships. At least he’s not “dating” a Chanel model who actually prefers men, right? 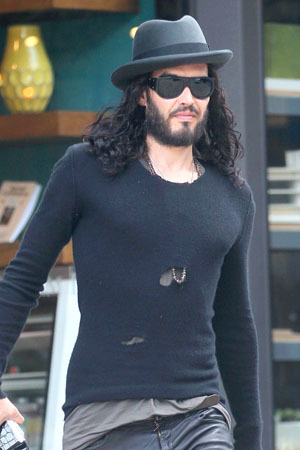 Is Russell Brand in a new relationship, or just on the rebound?